1. How is traffic in Vietnam? All of our tours guided by a local experienced riders who know the traffic well and will show you the local traffic rules just in order to ride as safe as possible .what’s more, we will ride you on our safe way by taking you out of busy traffic or taking a muddy, narrow but safe road with a special view. 2. Where to buy insurance for the motorcycle trips in Vietnam? The biggest insurance companies in Vietnam are Bao Viet( National Insurance Company) and Gras Savoye Willis ( French Insurance Broker ). They are big in Vietnam but they won’t cover you if you have no Vietnamese motorbike riding license. To get the Vietnamese motorcycle licenses or convert your license to the Vietnamese ones is so complicated and take plenty of time to do paper works and waiting. 3. How to have good motorcycle ride in Vietnam? * The best place to ride in Vietnam is the North. Just about 100km to the north of Hanoi city, you will see green mountainous area with much less population and very beautiful winding roads along valleys those are perfect for motorbike ride. However, it is rain a lot here so the best time to ride in north Vietnam is from September to the next April. * Vietnam is a kingdom of horn, It is very necessary to use horn here. The reason is that most of the bikers here don’t use driving mirrors or never look at them. They only let you take over them or leave you safe when they hear your horn. So please don’t be quiet on Vietnam road. Where we stay overnight on the tour? After a long riding day with a lot of activities, We know a comfortable place to rest overnight is a special concern. A relaxed and enjoyable accommodation is not only to state the quality of the tour but also to get the energy back for the possibly hard riding days after. Staying with the local family,cooking and having meals with them and sleep in their houses is a special experience which includes in all of our tours. All the families we choose to stay with have special permits from the local government so they’re certificated and they all have nice houses on stilts. Below is the equipment you can expect to have at the homestay: private mats, blankets, mosquito nets, fans, clean toilets…and great view and peaceful atmosphere. 4. How big is the bike to have good ride in Vietnam? Almost the Vietnamese people don’t use the motorbikes those are larger than 175cc. Most of the Vietnamese people ride small scooters with capacity of around 100cc – 110cc, until May 2007 when Vietnam joined WTO. It took sometime to have bigger bikes imported into Vietnam, but it’s likely that just few local can own these bikes as import tax is 90% and VAT is 10% (a bike costs twice as much as in many other countries). Because of local traffic and road conditions, the big motorbikes in Vietnam seem to be unnecessary. We’re one of the top motorcycle tour organizers in Vietnam that take the best care on the bikes for our tours. We at present use mostly Honda XR125, Honda Fortune 125, Suzuki EN150, Honda XR250 and Honda CRF250 for all the tours in Vietnam. They’re not big bikes but they’re almost new (year 2013-2014) and good and safe enough for all motorcycle tours in Vietnam. 5. How long time ahead should we book the tour and how do we pay/book it? We usually confirm service/make bookings with tourists around 6 to 8 months before departure. 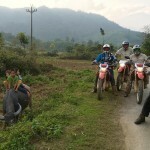 Honesty, we’re not so big Motorcycle Tour Company in Vietnam, our bikes and guides are not unlimited. We’ll close all service when all bikes and guides are fully booked so bookings with us should be made before we’re unavailable especially for the big group from 5 people. When we together finalize everything/agree with the final confirmation to book the tour, we’ll send you a secured link (via the link of OnePay) to pay deposit (30% of the total cost). It’s surely safe, fast and easy with the fee of 3,5% for the local bank. The balance will be paid at our office in Vietnam by cash or credit cards. 6. Is International Licence valid in Vietnam? Although some of the Presses reports to the contrary Vietnam does recognise the validity of international licences. Whilst some authorities in remote regions may not be able to comprehend a document written in a foreign language they go a long way in smoothing out any potential difficulties should an issue arise. They also take care of any licence requirements that you might have in your insurance polices. Formally, no licence is fully valid in Vietnam, even an international driving licence, as it needs to be officially translated (at Vietnamese Embassies or in Vietnam). The question of having or not a motorbiking driving licence mainly concerns your insurance. On the other hand, if you are working in Vietnam under contract for at least 6 months you could easily get a local driving licence. Traffic police generally don’t stop Westerners in Vietnam to check licences simply because they don’t speak good English or feel confident to deal with it. In addition, in the same time they can deal with many other Vietnamese people. Mui Ne in Southern Vietnam have been the only exception where they started checking licence. Informally, many recent international driving licenses which include Vietnam in the country list are accepted by the traffic police on the road. 7. Is there always a support vehicle on the tour or just a guide/Mechanic? Having a support vehicle or not is an optional. The tour price does not includes support vehicle. The support vehicle is recommended for all the our Motorcycle tours in Vietnam so that it can carry all your things and keep them dry and clean. Depending on the length of the tour and the number of riders, we give you the right price for the support vehicle. Please contact us for more details! 8. What about Foods/Drinks on the tour? All meals on the tour are inclusive in the tour price, vegetarian food can be accommodated. However the drinks is not included. We would like to say food on the tours is one of the most important reasons to make our clients come back for more. We serve almost local Vietnamese food on the tour. Generally, Vietnamese food is light but it’s surely not boring and so healthy. We can be sure all food is fresh with a lot of vegetable. We sometimes choose a basic roadside restaurant for meals but food is always fresh and plenty to choose. Such as famous PHO (rice noodle soup), BUN CHA (special noodle with grilled pork), NEM (Spring rolls)…The local people have different methods to cook so we can be sure you can have different food for each meals during the long motorcycle tours in Vietnam. 9. What should I bring and what will I do with my bags during the tour? >> Motorbike riding jacket, helmet, gloves, boots (rubber boots for rainy season in North Vietnam from May to September), summer gloves, balaclava, t-shirt, socks & underwear, long sleeved shirt, turtleneck shirt, extra jeans, light jacket, leather chaps, zip-lock bags, riding boots, bandanas, sunglasses and goggles. >> Personal items: basic toiletries, emergency cash, sunscreen and earplugs. >> Emergency items: first aid kit, emergency contact number, list medical conditions, list medications, flashlight, chargers and duct tape. >> Miscellaneous: small towel, bath towel, trash bags, bungee cords, camera and cargo net. During the tour with us, we can store the un-necessary bags/suitcases with us safely at the office or bike store. 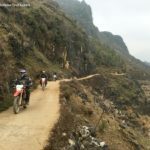 For some riders do the Ho Chi Minh trail motorbike touring or for riders who start and end the tour in a different places we can help to transport the bags/suitcases (or un-necessary things during the trip) from the starting point to the ending point with a friendly price.